In 2012 I watched the tweets roll in for the Newbery Award. I clearly remember seeing that Eugene Yelchin had won an honor for Breaking Stalin’s Nose and I quickly felt a sense of panic. I didn’t know this book. Ever grateful for the internet, I quickly opened a new page on my browser and ordered a copy immediately. My students returned from Art and I shared the winners with them and assured them that the copy of Yelchin’s book would be here within the week. Reading it, I was fascinated. Here was a historical fiction book that was short and had bits of humor intertwined with a compelling story. I knew many students would enjoy it when I brought it into the classroom, and I was correct. This past year Breaking Stalin’s Nose was on our state award list of nominees. Students in my school earn incentives from the librarian for reading books off of that list. Yelchin’s book was picked, initially, time and time again because it looked short. What the students were fascinated by, however, was the story. As a result, I was excited to here that he had a new book coming out, Arcady’s Goal, and even more thrilled when the publisher offered to send me an advanced copy. 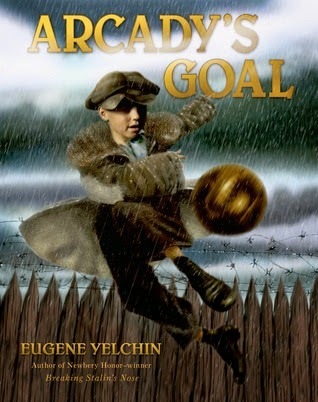 In Arcady’s Goal we return to Soviet Russia under Stalin’s rule. Arcady has lived in an orphanage as long as he can remember—his parents were enemies of the state. These state run orphanages are the things of nightmares. Food rations, cruel guards, barbed wire fences—not where you want children to grown up. The only joy Arcady has is soccer, where he excels. One day the inspectors come to visit the orphanage and everything changes for Arcady. I was fascinated by this book because Yelchin shares another bit of history I was ignorant about. Reading the author note at the end fascinated me. The long reaching arm of Stalin still can be felt today by descendants of these so-called enemies of the state. I think I will need to book talk this book much as I do Breaking Stalin’s Nose, with a lot of building of background knowledge. Then the students will be able to grasp the story much better. I have a feeling this one will be popular with my class. They will want to root for Arcady. His feelings of confusion and anger throughout the book are heart tugging. My only complaint is that I didn’t want the book to end. I felt the need to stay with Arcady awhile longer. Check this one out, my friends, you don’t want to miss it.